Millennia-old stave churches, spectacular fjords, rollercoaster bridges that cross the choppy Atlantic and sub-sea tunnels that burrow under it—Norway’s highways are road trip gold. 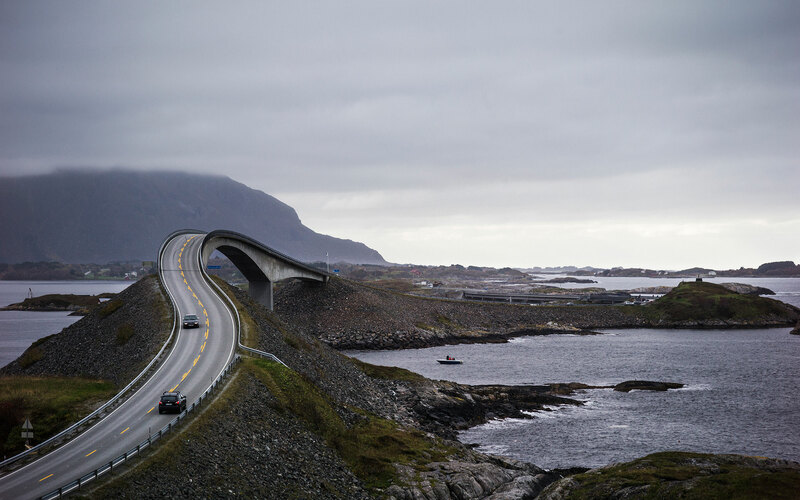 The Nordic nation has developed 18 official National Tourist Routes that crisscross the country, featuring contemporary roadside art projects and modernist architecture. Roads connecting towns to their airports are usually the dullest stretches of asphalt on the planet. Not in Sogndal. Moments after landing and getting our rental car at the dinky Hertz counter, my Swiss architect husband and I found ourselves spiraling down the pine-lined gyre of a road that connects the fjord-perched Haukåsen Airport to town. Even for a native Swissman used to driving in the Alps, this was some treacherous Nordic turf. But we’re not here for the roads, but rather what’s on them: Nordic Architecture. In 2012, Norway began developing 18 official National Tourist Routes that crisscross the country and feature contemporary roadside art projects and modernist architecture worthy of a lingering stop. 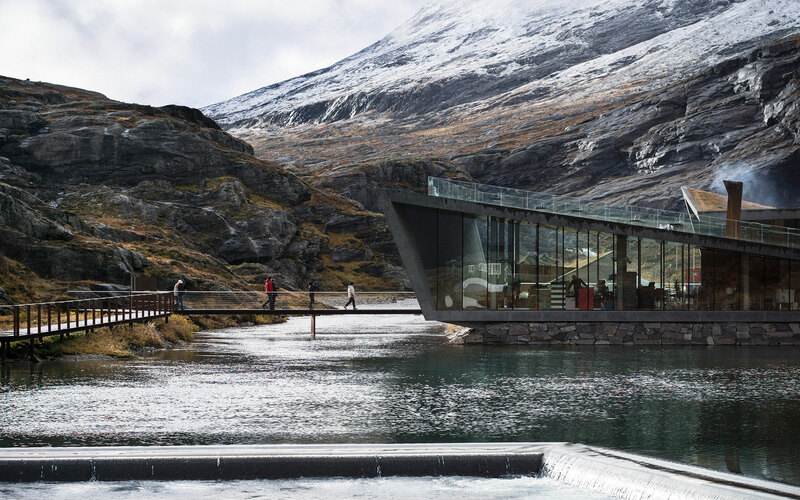 The sites—largely designed to lure automobile tourists to a country typically visited by cruise ships—include rest areas with glass-encased waterfalls, dramatic fjord overlooks, angular ferry terminals, and cubist design hotels—will be periodically unveiled across Norway through 2023. We’re going to spend three-days seeing a few of the sites on a design-minded drive from Sogndal to Kristiansund. The first thing we learn about roads in this remote region of Norway is that they’re as Spartan as they are nerve-rattling, with hundred kilometer long stretches, lonely blacktop humps and horizon-cresting curves with nary a sign of human development in sight, a rarity in Europe. Our first stop promises an appetizer of ancient Nordic design. We follow Rv5 to the timber Kaupanger Church, held together by 22 timber staves and dated to 1137AD. It’s not Norway’s most magnificent Stave church (home to 28 in all), but it’s magnificent multi-tired layers offer a glimpse of the muscular Stave designs, still studied by contemporary architects and reflected in modern builds we’ll see in the coming days. We pop into Kafé Krydder (Parkveien 6), a perky yellow cottage in Sogndal town for a quick coffee and a sticky cinnamon boller (bun) before embarking on the next segment. After continuing on Rv5 for 23-miles, we reach the Norwegian Glacier Museum, designed in 1991 by late Pritzker laureate Sverre Fehn. Like so many contemporary builds, the building takes on an cylindrical UFO-shape, but uses smooth gray poured concrete instead of steel and glass. As it’s a glacier museum, the main focus is on climate change. Deniers and doubters can take a look right outside and see Europe’s largest mainland glacier, Jostedalsbreen, which after years of advancing, succumbed to the heat and began retreating in 2012. Inside, artist Bård Breivik’s ice-sculptures are made with actual Jostedalsbreen ice. We continue on RV5 for another 15-miles cresting the frosty glacial peaks of the Breheimen range before descending back into the greener valleys below. 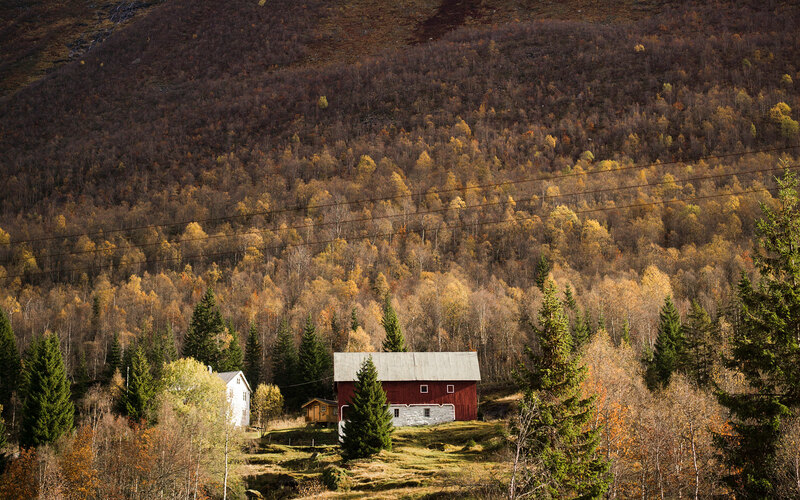 At Skei, we switch to the Rv39 north to Byrkjelo, gateway to Jostedalsbreen National Park and home of the voluptuous, shingled Breheimsenteret, which serves as a tourist information center. It burned down in 2011 but was rebuilt by architect Rolf Sande from Arkitektkontoret in 2013. After a few snapshots, we veered northbound on Rv60 for the 83-mile stretch to Stranda. Here, the shore road narrows to hug Innvikfjord’s four hairpin curves, before snaking aside the eastern flank of the 1,686-feet deep Lake Hornindalsvatnet, Europe’s deepest and fed by trickling, icy blue glacial streams. After, we crossed from Sogn og Fjordane fylke (county) to Møre og Romsdal to reach Stranda’s ferry terminal. The Trollstigplatået lookout and rest area. Norway’s ferries run frequently and are easy to navigate, but like many things here, are not always cheap. After a 15-minute ferry crossing to Liabygda (tickets avail on board; $8-30) we continued north on Rv63—the Geiranger-Trollistigen Route—for 21-miles until reaching the Juvet Hotel (from $210/night). Designed by architects Jensen & Skodvin in 2010, the hotel’s minimalist timber modules were used as a set in the 2015’s Oscar-winning Ex Machina directed by Alex Garland. Concealed behind a weathered barn on a steep bank of the Valldøla River are nine gray modules serving as rooms, each backed with a panoramic glass wall overlooking nothing but birch, moss, and melting cerulean water from the Sunnmøre Alps. After dinner of fenalaar spekekjott (dried lamb) and klippfisk (salt cod), we spent some time with owner Knut and his sweet English Springer Lucy before plunging in the icy Valldøla River followed by a soak in the outdoor hot tub. After, we retired to our room and watched the moths glide over the glass during the prolonged Nordic l’heure bleue. Up early, we made a quick coffee run 10-minute downhill to Gudbrandsjuvet Café, another glassy Jensen & Skodvin design attached to a viewing platform overlooking the raucous Gudbrandsjuvet waterfall and gorge. Back in the car, we zig-zagged 18-miles north on the steep Trollstigen Road (Troll’s Path), its embankments strewn with large jagged rocks softened over time with sea-green moss that almost glowed, highlighting the otherworldliness of this ancient primordial landscape. At the top past the stone bridge is the angular Trollstigplatået lookout, a rest area complex and pavilion surrounded by glacial pools and rock-perched walking platforms dangling 2,500-feet over the Isterdalen Valley and gushing Stigfossen Waterfall below. 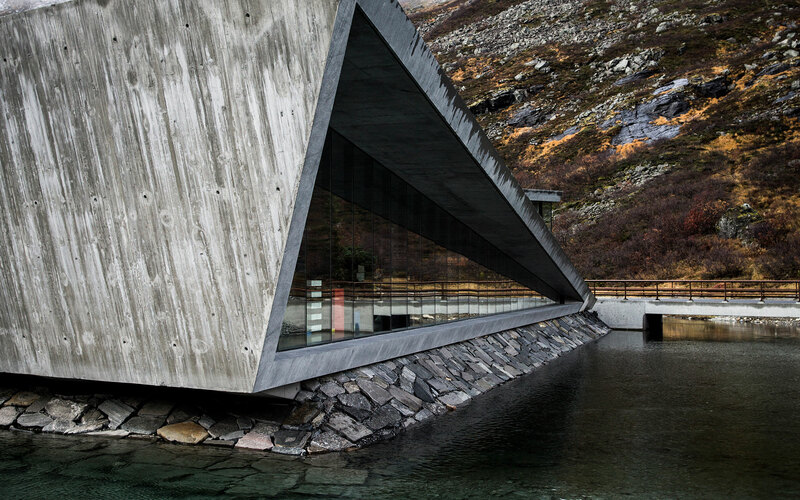 The project was completed by Oslo architect Reiulf Ramstad in 2009 and pays homage to the harsh weathered landscape of Trollstigen, and makes it quite easy to imagine trolls living here. A cafe opened onsite in 2012. We U-turn and double-back down past the Juvet Hotel towards the town of Linge, home to the Linge Ferjekai, a boxy glass and timber ferry terminal designed by Knut Hjeltnes and dubbed by locals the “Million Dollar Toilet” for the bathrooms it conceals inside. After the 15-minute crossing of Norddalsfjord, we continue south on Rv63 to one of the most popular sites of the National Tourist Route: Ørnesvingen. Here, overlooking the majestic UNESCO-inscribed Geirangerfjord below, artist May Eikås Bjerck and Bergen-based architects 3RW harnessed all the beauty and wildness of an icy waterfall and reveal it in a glass ledge that juts out from underneath a walking platform and emptying out over the side of the mountain. The force of the water is so strong that it’s been known to shatter the supporting glass, a reminder that when humans are pitted against this unforgiving Nordic landscape, they often lose. 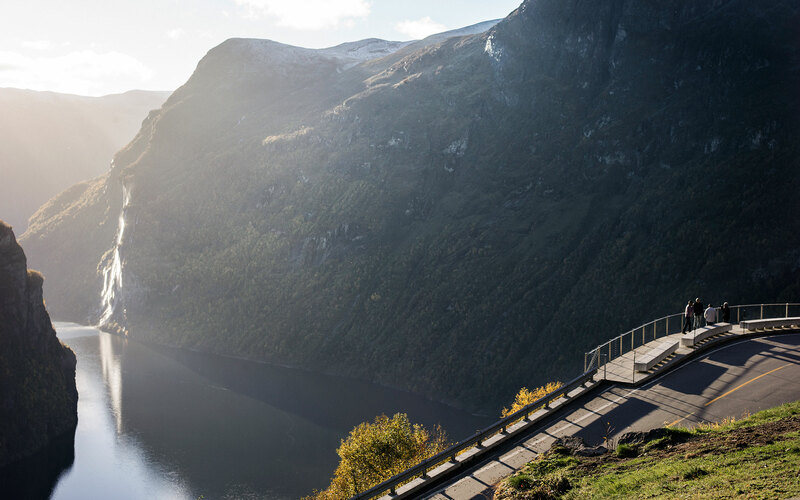 We follow the dizzying switchback roads 5-miles down to picturesque Geiranger town and stop for a heaping shrimp salad at Brasserie Posten (from $28) in a converted postal space on the marina. For spa seekers, the Union Hotel (spa access $35) 1-mile up the road offers some of the region’s best spa facilities, though the hotel’s drab 1980s re-design leaves something to be desired. From here, the scenic one-hour ferry crossing to Hellesylt from Geiranger leaves every hour, cruising over Geirangefjord’s otherworldly walls of stone on either side peppered with abandoned miniature farmhouses, elegantly cascading waterfalls. In Hellesylt, we forge on for 38-miles north on Rv60 until reaching Sykkylven town. Board the Ørsneset-Magerholm ferry, a 15-minute crossing over the Storfjord, proposed site of the world’s longest suspension bridge designed by Oslo-based firm Aas-Jakobsen. Once across, we follow sign for 17-miles west to the small city of Ålesund, Norway’s cod capital and famed for its Art Nouveau architecture. Ålesund’s quaint harbor-town atmosphere and walkable crosshatch of quayside streets are the ideal antidote to a day of driving. The calls of screeching gulls and dense salty air provide a more intimate proximity to Norway’s harbor life than the lofty roadside kiosks can’t. We walk 5-minutes along the wharf to grab dinner at nautical-themed Sjøbua (from $55), a converted warehouse with a crackling fireplace. Prices aren’t cheap, but you’d be hard pressed to find a more sublime halibut gratin. After walking back, we climbed into the fluffy beds at wharf-perched Brodsundet Design Hotel (rooms from $120) re-designed by Snøhetta, the architects behind Oslo’s jagged and gleaming Operahuset. The rooms’ bulky ceiling beams are slightly intrusive, but make up for it with a handsome eggplant and charcoal palette and windows that fling open to the chocolate box harbor. We fuel up on shrimp salad, tubes of Mills Kaviar and curls of creamy brown gjetost cheese in Brodsundet’s sunny breakfast room before taking a quick morning spin through town on the hotel’s free bikes. A stop at Invit Espressobar and Interiorbutikk, gave us the chance to bag some designer Scandinavian homewares —including a white lacquered peppermill from Muuto and a few lavender vacuum coffee jugs from Stelton. 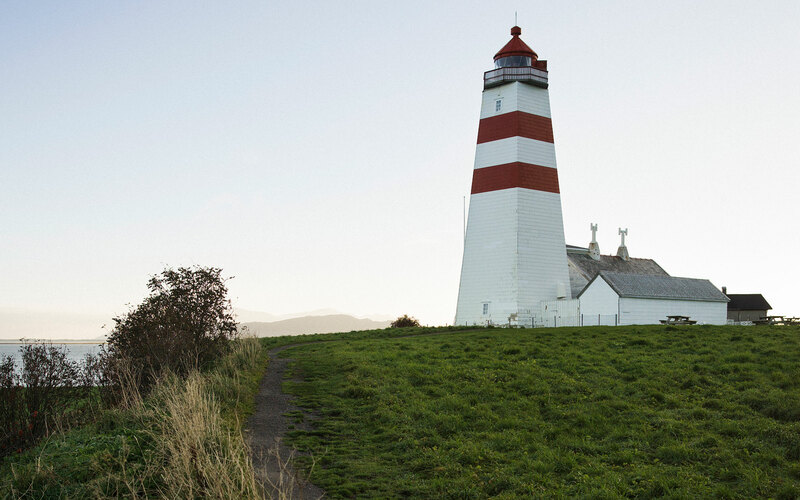 At the end of the town’s rocky seawall is Brosundet’s secret room 47, a lighthouse-turned-guestroom that’s an ideal place to get away from it all. Ålesund , it turns out, is the perfect town. We reluctantly say goodbye and make way for E136-East for 40-miles until reaching Vestnes. There, we cross to Molde on a 25-minute ferry and resume on RV663 and Rv664 for 25-miles to Bud, a much smaller fishing village known for its furtive WWII Nazi bunkers. Bud also marks the beginning of the famous Atlantic Road, known to many road-trip warriors as the world’s most scenic road. The salty and scenic 6-mile stretch of road plunges over the tumultuous Atlantic on a series of dramatic curved bridges connecting a scattering of small islands with four distinctly designer rest-areas along the way. Each merits a stop, but Jacob Røssvik’s glass and rusted steel Askevågen lookout and Kula & Hølmebakk’s Myrbærholmbrua, a steel mesh pedestrian fishing bridge, are standouts and the best place to admire the roads twisting bridges. Oslo Architects Ghilardi + Hellsten won a competition held by the Norwegian Public Roads Administration to design a hidden café and floating path around the island of Eldhusøya, which was completed in 2013 and very popular with locals and tourists. We spend our last night on the gloriously remote fishing camp turned hotel, Håholmen Havstuer (rooms from $150; +47 47 71 51 72 50). To access it, we continue a few miles north to Geitøya Island, where a small boat launch hides behind a souvenir shop. We call Island Manager Stian for pick-up and he’s there, flush-faced from the raw Atlantic wind, in ten minutes. The island is a welcome break from all things modern. Several brightly painted red and yellow 17th-century cabins cluster together atop the rocky archipelago. That night, we dined fireside on hearty bowls of fish soup and bacalao. The creaky dining room had a burnished timber floor window-perched tables that were an ideal spot to watch the last copper hues of the golden hour and the orange sun sink into the inky cold Atlantic. We rise early and keep watch for seals during the crossing back to Geitøya for the final 25-minute drive to Kristiansund Airport for our departure. Our last stop is Kirkelandet Kirke, architect Odd Østbye’s modernist 1964 church built to replace one destroyed by Nazi bombs, and Norway’s first to break from traditional form. A Brutalist concrete exterior protects the interior chancel’s 320 fragile panes of stained glass which fade from vibrant greens, reds and blues at the base to a pale white celestial hue at the top. It singularly best expresses modern Norwegian design: sturdy, subtle, and often full of surprises.